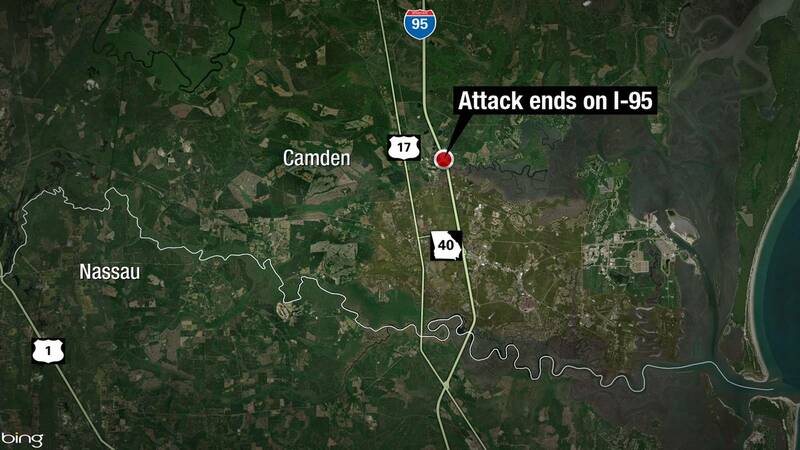 WOODBINE, Ga. - A man who rammed his ex-girlfriend's SUV and fired shots at her during a chase on I-95 in Camden County was stopped Sunday afternoon by a deputy who managed to end the violent attack with a strategic maneuver, the Sheriff's Office said. Deputy Robert Hoyt's pursuit intervention technique (PIT) pushed the Toyota pickup into the center median away from the ex-girlfriend's Ford SUV as she was trying to avoid the gunfire. The driver of the pickup, 53-year-old Fred Smith, then raised his .38-caliber pistol to his head and shot himself, deputies said. No one in the SUV was injured by the gunfire or vehicle pursuit, deputies said. The dramatic chase began about 2:45 p.m. Sunday when a Camden County 911 dispatcher got a call saying the burgundy Ford SUV was being chased by the pickup. The caller said the pickup was ramming her vehicle and trying to force her off the road. Deputies said the incident started in Glynn County when the woman saw her ex-boyfriend, Smith, following her vehicle southbound onto I-95. The woman, who is not being identified because she was the victim of a domestic violence attack, had ended the relationship with Smith about six months ago. She had a male friend riding in the front passenger seat as Smith continued to pursue her SUV. As the vehicles continued southbound, Smith became irate and was attempting to run the Ford SUV off the roadway, deputies said. Deputies were able to intercept the vehicles near the Harriette’s Bluff exit, but as they tried to stop Smith, he began firing a .38-caliber pistol at the Ford SUV and bullets shattered the back window of the Ford. After Hoyt's PIT maneuver and Smith's self-inflicted gunshot wound, the pickup came to a stop in the northbound lane of I-95. Camden Fire Rescue took Smith to Camden Medical Center, where he was pronounced dead. Smith, who listed his residence as Jesup, Georgia, had outstanding warrants and restraining orders from previous threats to the ex-girlfriend. Deputies said a stray bullet from the attack hit a BMW. The driver of that BMW, who is from Jacksonville, found a bullet hole and returned to Camden County to identify the Toyota pickup as the vehicle involved, deputies said. A .38-caliber bullet was recovered from the BMW. Bullets were also recovered from the Ford SUV, deputies said. The Camden County Sheriff’s Office said it is continuing to investigate the incident.